This is where I went. I think the stress of trying to ignore intense itching for a few days finally caught up with me. I’m not usually a napper, but boy did I nap that day. I think it was only a 20-minute power nap, but Todd says it was several hours. Maybe it was somewhere in between. I’m sure my mother will be mortified when she sees that I posted a picture of my unmade bed for all the world to see. I have to say it gave me pause as well, but I did it anyway. Besides, a picture of a made bed would have been deceiving – like I maybe fell asleep on the top. No, I was all warm and snuggly and wrapped in bliss. Not only does everyone get to see my messy bed, everyone gets to see that I desperately need bedroom furniture. My hope is that the masses will feel sorry for me and take up a collection. Just email me and I’ll let you know where to send the money. I also had to post a picture of this Mary Englebright pillow case that Todd uses. It’s actually an old pillow case of Katie’s, but he tells her it makes him feel pretty so he gets to use it. Now our deep, dark secrets have been revealed. When I woke up I was glad to learn Tim and Rachele had driven Todd’s truck to the park and took a walk on the path. At least they weren’t stuck here the entire day with nothing to do. I figured we’d drive to the visitor center, use the sparkling clean restrooms, pick up a detailed guide of the park and follow it to the spectacular flora and fauna. I couldn’t have been more wrong. There was no visitor center with sparkling restrooms. There was no detailed guide of the park. There WAS a lot of flora, but the only fauna we saw were domesticated dogs. Here’s a photo of the waterfall we saw. It was a beautiful drive, but the twins were using poor Rachele’s bladder as a trampoline. After some driving around we stopped at a restaurant called “Boonie’s Cafe”. It was time for lunch anyway so we thought we’d kill two birds with one stone. She ran in to use the facilities and the rest of us mosied. The “cafe” was actually a smelly, smokey bar. So we left and went down the street to Izio’s Casual Italian. The waiter had a thick Italian accent and it was difficult to understand him at times. I can’t help but wonder, though, if he switched to a heavy Brooklyn accent when he was in the kitchen. Regardless, the food was delicious. After lunch we drove back to the town of Jim Thorpe, named for The World’s Greatest Athlete. This is a bit confusing because, while he is buried there, he never actually lived there. Curious history notwithstanding, it is a charming Victorian town. 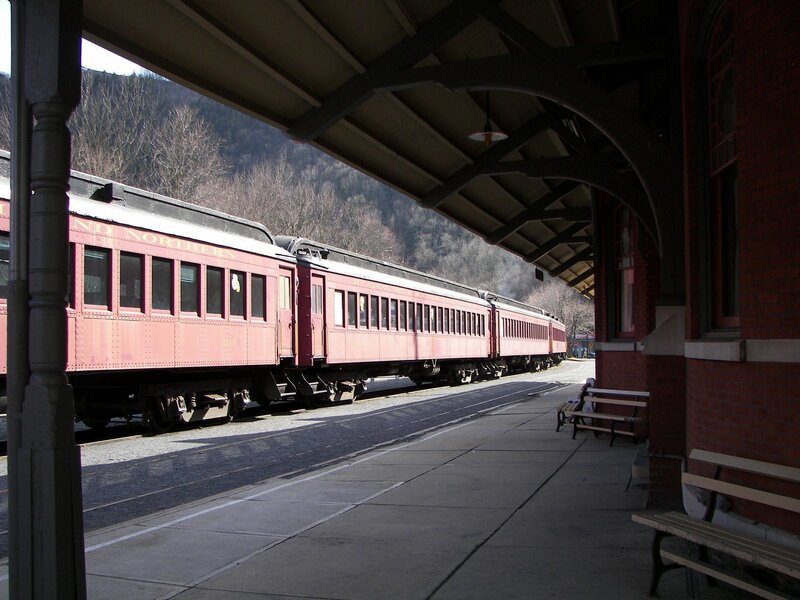 One of the big tourist attractions is the steam train that travels along the river through the Lehigh Gorge. Maybe some day we’ll take the train and see another waterfall. Easter morning we all got around and went to church. Very rarely are there small children in the service so they played this Easter Linebacker video. It’s a spoof on the Terry Tate Office Linebacker commercials and it’s pretty funny. Despite the somewhat irreverent levity, the rest of the service – especially the message – was wonderful. Tim and Rachele had to leave for the airport around 3:00, so we had a delicious Easter lunch before they left. Tim had made his famous mashed potatoes and I had made my broccoli salad the night before. All we had to do on Sunday was bake the pork loin. Unfortunately it took longer than it was supposed to. No matter, though. We still had plenty of time to eat and be miserable. The week was over when I dropped them off at the airport. We had such a good time with them and hope it won’t be too many years before they come back. Of course next time there will be four of them. What fun that will be!! My final photo is a picture of my Easter present. I’d seen something similar in a shop in Jim Thorpe and mentioned to Todd I’d like to have one of those for the entry. Katie and I skipped out of the store and went to the candy store next door. 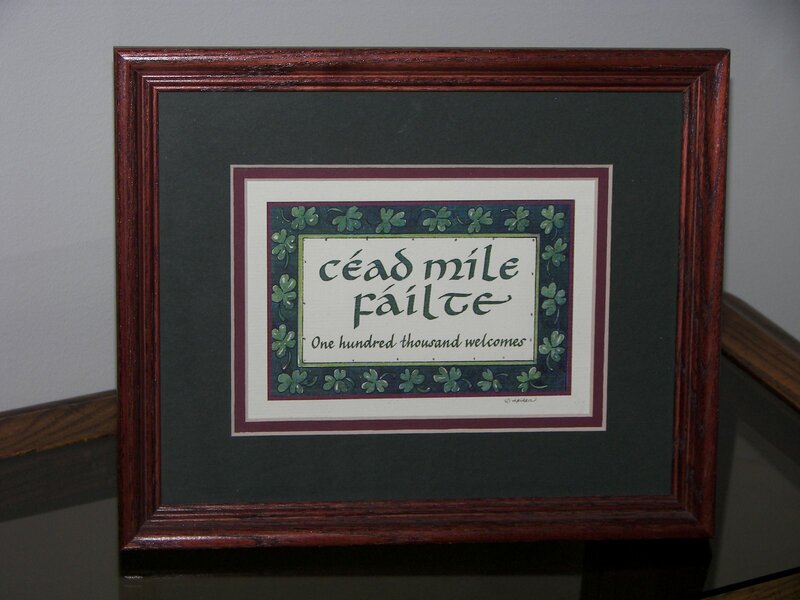 I don’t know if you can read the whole thing, but it says “Cead Mile Failte” which is Gaelic for One Hundred Thousand Welcomes. And that, my friends, was our spring break! Hey I think unmade bed day is my FAVORITE day of the vacation. I’m all for the spontaneous, unplanned and unexpected daytime NAP. Love Todd’s pillow case. Oh my goodness! I’m worn out just from reading it all! Don’t feel bad about the bed – remember all of that beautiful bedding I bought a little while ago? It’s still in the packaging and we are still using our mismatched sheets and duvet quilt, minus duvet cover! I’m very familiar with the Irish blessing…and this is one of my favorites. You mean people actually make their beds? I never bother unless my MIL is coming over.Sounds like a nice spring break.